I've been looking at the Windows 8 Registered I/O Networking Extensions since October when they first made an appearance as part of the Windows 8 Developer Preview. Whilst exploring and understanding the new API I spent some time putting together some simple UDP servers using the various notification styles that RIO provides. I then put together some equally simple UDP servers using the "traditional" APIs so that I could compare performance. Of course these comparisons should be taken as preliminary since we're working with a beta version of the operating system. However, though I wouldn't put much weight in the exact numbers until we have a non-beta OS to test on, it's useful to see how things are coming along and familiarise ourselves with the designs that might be required to take advantage of RIO once it ships. The main thing to take away from these discussions on RIO's performance are the example server designs, the testing methods and a general understanding of why RIO performs better than the traditional Windows networking APIs. With this you can run your own tests, build your own servers and get value from using RIO where appropriate. Do bear in mind that I'm learning as I go here, RIO is a new API and there is precious little in the way of documentation about how and why to use the API. Comments and suggestions are more than welcome, feel free to put me straight if I've made some mistakes, and submit code to help make these examples better. Please note: the results of using RIO with a 10 Gigabit Ethernet link are considerably more impressive than those shown in this article - please see here for how we ran these tests again with improved hardware. The tests consist of sending a large number of datagrams to the server under test. We send two sizes of datagram, the test datagram and the shutdown datagram. The server counts the datagrams that it receives and the time taken. It shuts down as soon as it receives a shutdown datagram. The servers that we are using for these tests are detailed here and the datagram generator is available here. Whilst the numbers that the servers report are useful for getting a rough idea of how the various API's compare they're not the whole story. It's useful to look at performance counter logs that are taken whilst the test server is running. The CPU usage of the server under test, and the entire machine, are useful indicators of how much further we could push a given server. The number of datagrams received, and dropped by the network and Winsock are useful to see, as is the non-paged pool usage, etc. To make the testing repeatable I've put together some simple scripts which create the required performance logs using logman, the command line interface to perfmon. This means that for each test run we can run a single command which creates and starts a performance counter log, runs the server and then stops the performance counter log. It would be nice to include custom performance counters in each of the example servers so that we can see more of what's going on inside, but whilst easy to do, using our Performance Counters Option pack, that's beyond the scope of these tests. The test client, or clients for when we're using two network links into the test machine, are started manually. We could automate this with winrs, as we've done in the past, but these tests don't really warrant that level of complexity. Our test system consists of a dual Xeon E5620 @ 2.40GHz, that's 16 CPUs in 2 Numa nodes with 16GB of memory. The machine has four 1Gb Ethernet network intefaces, a Broadcom BCM571C NetXtreme II GigE with two channels and a Intel 82576 Gigabit dual port adapter. We're using the Intel adapter for all of the tests shown here, sometimes using one NIC and sometimes two. Windows Server 8 beta Datacentre edition is running directly on the hardware. The client hardware is less impressive, but both client machines can push their 1Gb network interfaces to around 98% whilst running our datagram generator and that's more than enough for our purposes here. To get a feel for how the RIO API differs from the traditional API's the first test will compare a polled RIO server with a traditional, blocking, polled server. The code for the servers is available here along with some commentary on their designs. You'll need Visual Studio 11 to build the examples. The test scripts, mentioned above, can be downloaded from here. Each server has its own script and a text file that details the performance counters to capture during the test run. All of the scripts call a common script which sets up the performance counter log and then starts the server. You shouldn't start the clients until the server is running and has output its configuration details. Once the server receives its first datagram it will display "TimingStarted" and when it has received a shutdown datagram it will display "TimingStopped" and display the number of datagrams that it managed to receive, the time taken and the datagrams per second. You need to copy the x64 release builds of the example servers into the same directory of the test scripts and then be sure to run the batch file and not the exe directly. As an initial test we will run the traditional UDP server with one test client. We'll set the test client to send 10,000,000 datagrams, which takes a little over one minute. Once the test was completed the server reported that it had processed 9,952,510 datagrams in 86,880ms, a rate of 114,000 per second. Running the RIO polled server example with the same network load the results were broadly similar; 9,932,228 datagrams in 86,681ms, a rate of 114,000 per second. At first glance it seems that RIO isn't so impressive, however we need to remind ourselves of what these example servers are doing; all they're doing is pulling datagrams off of the wire as fast as they can. They're both doing so on a single CPU of a 16 CPU machine and, from these results, it seems that on, this hardware, both APIs can quite easily handle a single saturated 1Gb network link. Whilst the two servers at first appear to behave almost identically under the load it's only when we start looking at the performance counters that we can see that actually the two APIs have completely different performance characteristics. Here's the graph for the traditional UDP server. Note the thick blue line, that's the amount of time the process spends in kernel mode, on average 37.133% of its time. The graph from the RIO server is a little different. The thick blue line is still there, it's just that it's 0 most of the time. The average is 0.167%. Another thing worth noting is that the spinning that the RIO server does is obvious from the fact that it uses 100% of a CPU (see the thick red line) and that most of that is spent in user mode code (the dotted green line that runs across the thick red line). Another thing that is interesting to see is the non-paged pool usage; the RIO server uses a fixed amount for the life of the process, 8,064 bytes, the traditional server uses 4,192 bytes for most of the time but has some random peaks, the highest of which is 133,656 bytes. Running two clients, each sending 10,000,000 datagrams to different network cards on the test machine gives us similar figures, the traditional server remains ahead of the RIO server with 19,847,578 datagrams to 19,279,842 datagrams. It seems that with the given hardware both APIs are capable of dealing with two saturated 1Gb links. The example servers all have a DoWork() function which allows us to add some "processing" for each datagram that is received, this gives us a slightly more realistic test as, except for discard servers, most servers need to do some work with each datagram that arrives. Running the tests again, this time with a 'workload' of 100 gives the following results. Clearly a more realistic example allows the RIO API to show what it's capable of. Note that I ran a longer test, with two clients each sending 50,000,000 datagrams as the second test showed some results that seemed to imply that the traditional server had become overwhelmed near the end of the test. The longer test was to see if it could recover, it didn't it simply entered the overwhelmed state and stayed there until the end of the test. This is possibly due to the socket's recv buffer filling up. 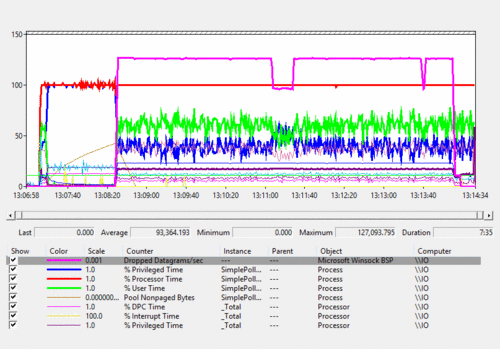 As can be seen from these graphs, the traditional server quickly gets into a state where it is dropping vast numbers of datagrams (thick pink line) whilst burning more user mode CPU than kernel mode CPU having maxed out the single CPU that it's running on. The RIO server doesn't drop any datagrams and the graph looks surprisingly like the previous one with no load. To look at how the performance of the RIO server degraded as the workload per datagram increases I ran some more tests. Bear in mind that these results are specific to the test machine I was running on and that we're testing on a beta version of the Windows 8 Server operating system. Even so, the figures are impressive. The lack of kernel mode transitions allow much more CPU to be used for real work on each datagram that arrives. The registering of I/O buffers once at program start up reduces the work done per operation and also means that your server will use a known amount of non-paged pool rather than a completely variable amount. Though non-paged pool is more plentiful than it used to be pre-Vista this is likely still an advantage. The RIO API isn't especially complicated but your server designs will be different. The simple polling example server that we used here is unlikely to be an ideal choice as it uses 100% of its CPU for the whole time that the server is running. It's also a little unfair to compare RIO to such a simple traditional server but; there are better alternatives, but it's a useful line in the sand. As we'll see in the following performance articles there are better, and more scalable ways to use both APIs. If you're interested in digging deeper into the results used in this article then all of the performance logs taken whilst running the tests are available here. 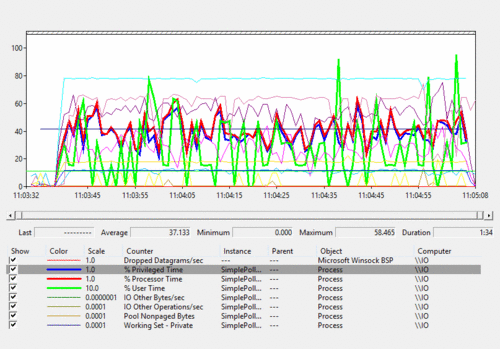 Windows 8 Registered I/O - Generating load for the performance tests was the previous entry in this blog. 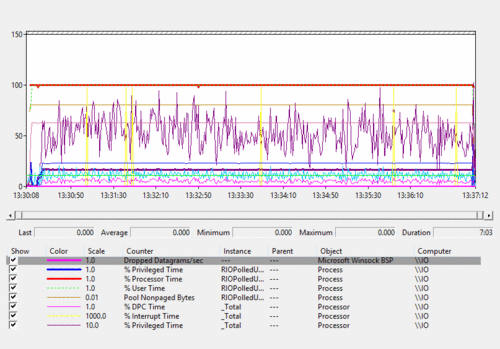 Windows 8 Registered I/O Performance - 10 Gigabit networking... is the next entry in this blog.